High Grade Cal.351, 17 Jewel Bumper Automatic Movement, in Top Condition! Since the company was founded in 1848, Omega has pioneered a huge range of innovations. Britain’s Royal Flying Corps chose Omega watches in 1917 as official timekeepers for its pilots and again in 1940, RAF Pilots watches were supplied by Omega. The 40s also saw the first tourbillon wristwatch and the first of the famous Seamaster watches, whilst the 50s and 60s introduced the legendary Constellation, Speedmaster, Seamaster 300 and Railmaster. Over these years, everyone from John F Kennedy to Elvis wore Omega watches on official duties. What’s more, in 1962, astronaut Wally Schirra took his Omega Speedmaster into space on NASA’s Mercury Sigma 7 mission, and in 1969 two Speedmasters landed on the moon, worn by Neil Armstrong and Buzz Aldrin. A superb example of a classic, late 1940s gentleman’s Omega Automatic dress watch, with a large sized, 36mm, 18ct Pink Gold case, in fully restored condition. Further features include the stunning two-tone dial and the amazing condition of the high grade, Cal.351 bumper automatic movement. The watch has just completed a full restoration by ourselves and is in pristine condition throughout. The superb two-tone Silver and Ivory dial has applied pink gold ‘Spearhead’ hour indices, matched with the original restored ‘Dauphine’ hands, all of which look wonderful against the pink gold case. The dial is typical of the early ’50s, so effortlessly classic, elegant and stylish. This is just the kind of style which will never look out of date or out of place. The dial is signed with an applied pink gold Omega brand, with ‘Omega’, ‘Automatic’ below and ‘Swiss Made’ at the very bottom of the dial. The solid 18ct pink gold ribbed case measures just slightly under 36mm in diameter, excluding the Omega signed crown. This watch case has exceedingly attractive sweeping lugs which add an extra touch of class to this watch. Omega watch cases in pink gold are particularly rare as few were made during this period. These are particular favourites of ours, so we work hard to track to these down, then restore and bring them back to life and their original condition. The watch case has been carefully inspected, cleaned and lightly polished to bring it back to the immaculate condition you see here with no scratches or marks visible to the naked eye. The case-back is of full thickness and has never been inscribed. As can be seen, the original Omega Chronometer grade Cal.351, copper-tone bumper automatic movement is totally pristine. Bumper movements use a rotor which winds the movement by gently bouncing backwards and forwards between two spring ‘bumpers’, caused by the movement of the wearer’s wrist. These watch movements are very accurate and reliable making this watch perfectly suitable for both evening wear and everyday use. Cal.351 movements are highly sought after and highly regarded for their accuracy and reliability. This watch has just been fully overhauled and serviced by our vintage Omega specialist watchmaker and is calibrated to run arrow straight within +9 seconds per day with a 42-hour power reserve when fully wound. We are therefore more than happy to offer this watch with our 12 months’ warranty on the movement*. The movement is signed Omega Watch Co Swiss – Seventeen Jewels – and Cal.351 with the serial number 11960817 which dates the watch to 1947. The watch has been fitted with a very high quality Hirsch Burgundy Crocodile leather strap with a matching pink gold plated Omega buckle. We think this contrasts very nicely with the pink gold case and the dial, however, if a different colour or style of strap is preferred, please let us know and we will do our best to oblige free of charge. We carry tan, conker, dark brown and black in stock, in plain padded leather, crocodile skin or lizard skin, but can also obtain most types and colours of strap from our partners at ‘Watch Obsession’ within 48hrs. Please take a look at their huge range of 18mm straps if you wish, here. Although there are no original papers with this watch, the reference numbers, markings, signatures and hallmarks are all correct, dating this watch to late 1949/early 1950. Detailed particulars will be included with the receipt, along with our 12 months’ warranty*. A separate insurance valuation for the replacement value of this watch will also be provided at the time of sale along with our unique ‘Lifetime Authenticity Guarantee’ which states: “If this watch proves to be anything less than totally authentic, or not as described, Vintage Gold Watches of London will offer you a full refund at any time”. 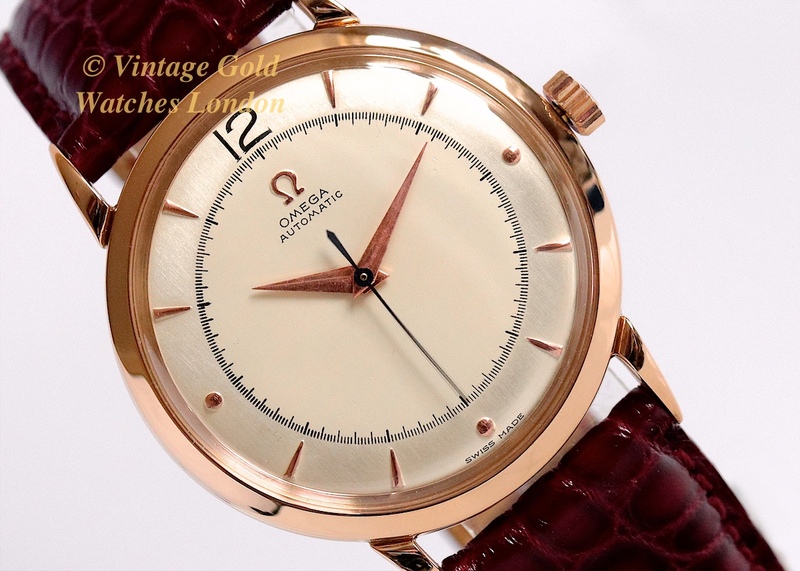 A beautiful example of a top of the range Omega bumper automatic dress watch with a large-sized 18ct pink gold case. The movement is of a very high grade and on a par with watches far more expensive than this. Indeed when new, this watch would have cost more than the equivalent Rolex. Omega watches are highly collectable and the rarity of this watch means the value will always remain strong. A word about our prices – We always try our hardest to acquire the very best quality watches we can find before restoring these to the highest possible standards. We then offer these at the fairest prices we can, taking into account our pre and post sales care and service. This approach inevitably means we will never be the cheapest, but nor will we be the most expensive. Indeed there are a number of well known stores in West London which are very successful, charging between two to three times the price you see here. We therefore consider our prices to be fair, given the quality of watches we have to offer. We are happy to accept PayPal as this is the quickest method of payment. However, if you choose to pay by UK bank transfer, we will be pleased to pass on a 3% transaction saving to you. Please contact us to reserve the watch and request our bank details. Similarly, if you wish to pay by International SWIFT or International Bank Wire Transfer, we will provide you with our BIC / Swift number and our IBAN number. Please note, we also welcome part exchanges and if you have a watch or small collection for sale, please contact us as we will be happy to discuss this. We will be happy to Service, Repair, or Restore your watch, all at ‘sensible’ prices. Please see here. We will be happy to answer any questions and offer advice about this or any of our watches listed for sale. If you would like some general advice regarding any aspect of vintage watches, including buying, selling, or collecting, we will also be very happy to hear from you. We await your call!